This week, our wine writer Celine tastes the 2016 Moraitico Rosé, 11.5% and shares it with us. Taste this unique wine from the island of Paros, along with other Aegean Island wines –and food pairings! at our September Wine Tasting. Nothing goes better on a sunny and hot summer day than a light and fruity rosé. You may have heard about the benchmark set by the refreshing and light-bodied Bandol rosé from Provence, with its romantic color as well as the elegant flavours on the palate. Just imagine having a wonderful holiday by the Mediterranean sea and leisurely sipping a glass of this zesty drink. If that sounds like you, then you cannot miss this 2016 Island Rosé produced by Moraitico winery. The winery Moraitico is located on the island of Paros in Greece, on the Aegean sea, southeast of the Greek mainland. Just like Santorini, this windy and mountainous island has a hot and dry Mediterranean climate that contributes to the tropical fruit notes of the wine. Thanks to the cooling effect of the mountain slopes and the strong wind during the growing season, grapes are able to ripe slowly and accumulate the balanced amount of sugar and acidity. This is the reason why crispy and refreshing wines come from this region. Generally, rosé wines can be made following three different methods, very rarely involving the use of oak barrels. For some inexpensive New World wines, red wines and white wines (not grapes) will be blended to make a rosé. Another way of rosé winemaking, is to shorten the maceration period- compared to normal winemaking of dry red wines. Depending on how much colour and tannins the producer plans to extract, the length of this maceration period varies. Hence the unique colour and taste of the rose wine. The last method is direct pressing, which crushes and presses black grapes, but in the same way as when making white wines rather than red wines. This avoids the extraction of colour and tannins that are necessary in red wine production. As a result, a more delicate colour is usually achieved. Two local grape varieties are used in this rosé. Malagouzia (aka. Malagousia) is gaining popularity throughout Greece after being rescued from extinction in the 1970s. It is a versatile variety that can make both dry and sweet white wines. The other grape, Mavrotragano, is a dark-skinned black variety that has been traditionally used to produce sweet red wine. This variety has thick skins and small berries, leading to deep-colored wine but with soft tannins. 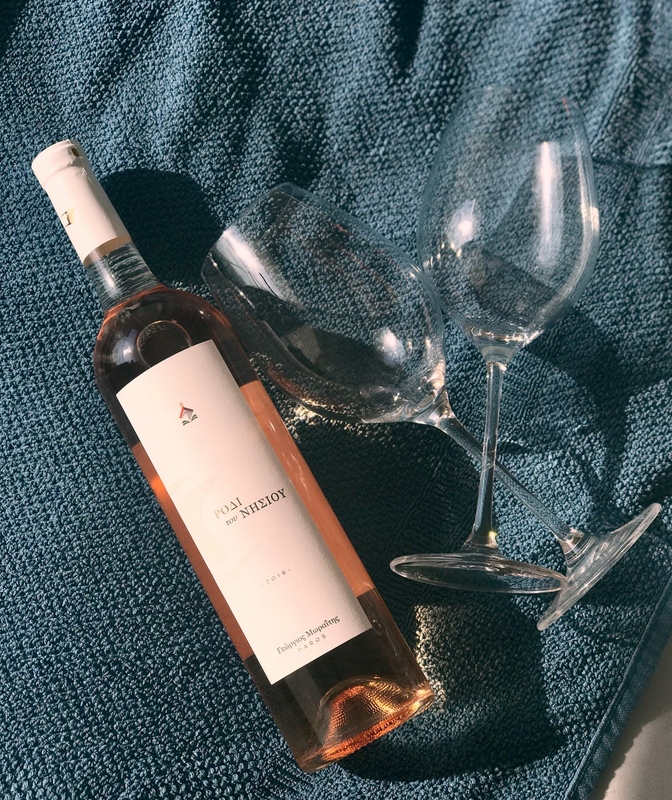 The Island’s Rosé demonstrates a graceful colour between pink grapefruit and salmon, and has exquisite aromas including grapefruit, melon, peach, red rose, and some hints of grape — just like the Muscat grapes you may get from the market. On the palate it is dry with high acidity, with low alcohol and light body. The flavours of grapefruit and tropical fruit stand out, surrounded by other fruity notes such as melon, rose, and the Muscat grapes. Although some sweetness may be felt in the beginning, this rose has a very citrusy finish. As a dry wine, the sweetness seems to be a result of its intense flavours of tropical fruit, just as what a ripe Marlborough Sauvignon Blanc may present. Overall it is a very fruity and light rosé wine. It is not complicated but excellently refreshing, undoubtedly the greatest match for this summer. It is best drunk at 8-12°C, approximately 10 minutes after being taken out of your fridge. This wine can be paired with a wide range of dishes, including light salads and seafood. Squeeze some grapefruit and olive oil dressing on your lightly cooked or cured salmon, tuna or lobster and accompany it with this wine. You will find that a hot summer’s day will become more pleasant than ever. This entry was posted in Wine and tagged rose, summer, wine, wine tasting. ← Great Taste Awards 2018 – The Winners!